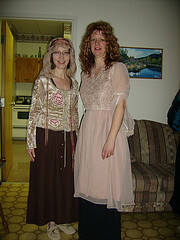 … are two of the best dressed medieval writers at a recent medieval feast put on by the students at St. Peter’s College. The food was eaten out of bread bowls, James O’Shea entertained us immensely with his juggling and all around comic announcements, the students put together a great skit of Monty Python’s Quest for the Holy Grail, and the evening was greatly amusing, and fun. There are more pictures here.